The end of high school can be a scary time. It means leaving the friends you have made over the last 12 years of your life, it means changing the routine you’ve lived with for so long, and it means figuring out what comes next. For many, this means college or university. Choosing post-secondary education comes with its own set of choices and questions about what comes next; what program should I choose? Should I move away from home? What school should I go to? How will I afford it? What if I don’t do well? What if I make the wrong decision? Now try and make those decisions with nobody to talk to. Nobody who has already been through this process to guide you. Nadira had these questions, and nobody to turn to, “I’m the first one in my family to go to university. I had nobody to talk to, nobody who paved the way for me”. Luckily, Nadira’s high school offered Big Brothers Big Sisters of Toronto’s Post-Secondary Readiness program, or Pump for Post-Sec. 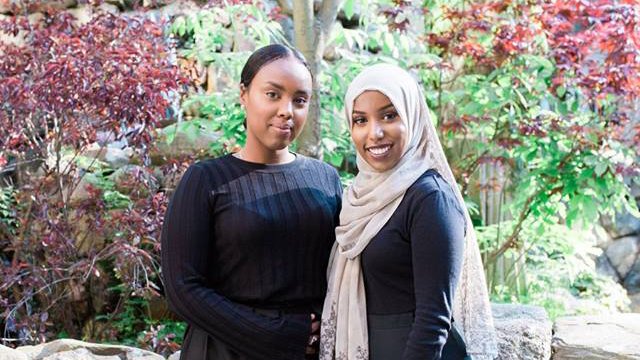 In this program she was matched in a group with a mentor from U of T to help guide her through the process of finding unique programs, applying to school, and financing your education. Nadira is now in her fourth year at the University of Toronto pursuing a specialist degree in Peace, Conflict and Justice Studies. In her spare time she volunteers in the Pump for Post Sec program, hoping to help guide other students like her. “Most of the kids are ethnically diverse, a lot come from low-income schools. They’re ranked lower for success, they live below the poverty line, and many of them are first generation to go to university in Canada. After high-school there’s no blueprint for them to follow, a lot of participants are in grade 9 or 10 and just want an outline what getting to university is like, they want a plan”. As a volunteer, Nadira says one of the biggest issues participants face is money. Pump for Post-Sec teaches participants about grants, bursaries, OSAP, bank loans and how to manage your course load and a part time job. “Money is never a viable reason to not go to university” she says. After learning about scholarships as a participant, Nadira applied for several and encouraged her friends to do the same. Before starting University, she was awarded a scholarship and able to fund her education. She will continue to volunteer with the Pump for Post-Sec program through her final years of school, and then transition to other Big Brothers Big Sisters of Toronto mentoring programs to help her community.